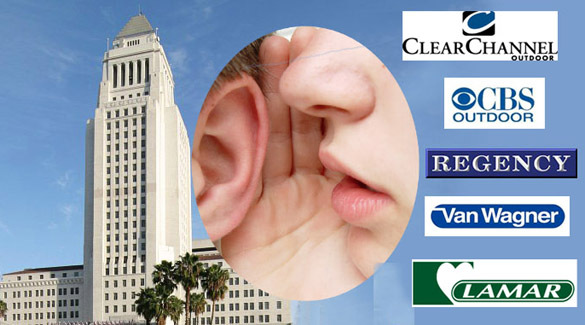 Billboard companies spent almost $400,000 lobbying L.A. city officials in the first six months of this year, according to reports filed with the City Ethics Commission. The spending comes in the run-up to tomorrow’s City Council committee hearing on a new citywide sign ordinance. By far the biggest spender was Clear Channel, which paid $196,358 to four different lobbying firms. Next was West Hollywood’s Regency Outdoor, with $76,225, and New York-based Van Wagner Communications, with $50,244. Others with lobbying expenditures were Lamar Advertising, $30,000; National Promotions and Advertising, $25, 840; and CBS Outdoor, $9,346. The latter company, a major owner of L.A. billboards, reported lobbying expenses only for the first quarter of this year. These companies and others with an interest in the new sign ordinance have also made campaign contributions to the three members of the Planning and Land Use Management (PLUM) committee who will be considering the ordinance. 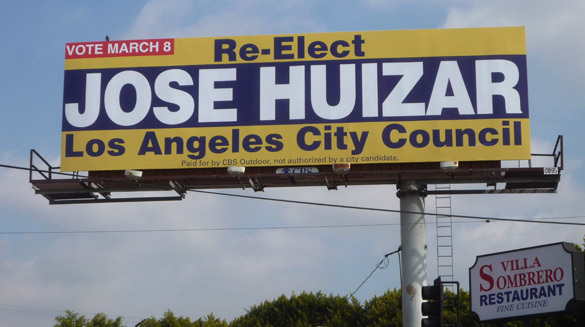 In the period leading up to last spring’s municipal election, committee member Jose Huizar received contributions and free billboard space from sign companies worth $15,500, while Paul Krekorian received contributions and billboard space totaling $4,500. Chairman Ed Reyes, who was not up for re-election, received $2,000 in contributions from billboard and sign companies over the past year. Billboard ads calling for Huizar’s re-election were donated by CBS Outdoor and Lamar Advertising, while Krekorian got free billboard ads from Lamar Advertising. Success! The motion to suppress changing digital ads on ride sharing vehicles advanced. Do you use Waze? Billboards Are Spying on You!